When I was young, adventure sports companies went through a phase where they thought, if you (as the climber) spent enough money, they could get you to the summit of the world's tallest mountain, Mount Everest (29,029ft). My Mom used to tease my Dad and say that she wanted to go. Unfortunately, in the late 90's, there were many deaths on Everest and the mountain returned to being a feat that only the most experienced and fit mountaineers could accomplish. 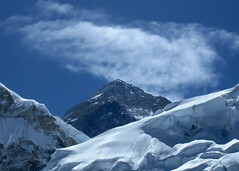 Still, many climbers returned without standing on the top of the world due to altitude sickness, frostbite, or unforeseen circumstances such as weather. 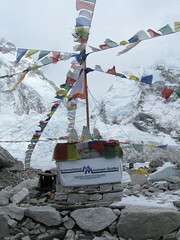 After summiting Kilimanjaro in April of 2008, I added Everest Base Camp to my "bucket list." I actually wanted/still want to go to ABC (Advanced Base Camp) on the Tibet side of the mountain, but China closed Everest to climbers until the very last minute in 2009. So, after some encouragement on my behalf, I convinced my Mom to sign us both up for a Nepal Side Everest Base Camp Trek with the famous mountaineering company, International Mountain Guides (IMG). It was a long and strenuous 18 days to say the least. 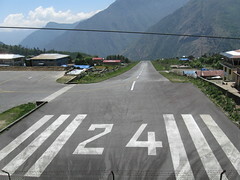 We faced everything from landing on the shortest runway in the world (thank you Agni Air who got us back and forth safely from Kathmandu to Lukla!) to diving off the trail to avoid killer Yaks. But those stories are all meant for a different kind of blog! I'm here to tell you about the food experiences I encountered during my trip. 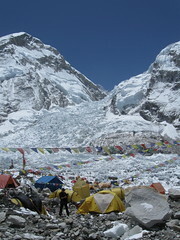 During the trek to Base Camp there are two options; camp in tents or stay in tea lodges. 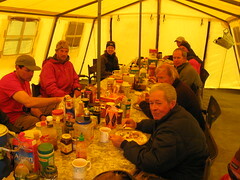 Our group of 10 took the tea lodge route, and this meant eating food prepared in the tea lodges. Food at the tea lodges is, well, very repetitive, and, almost all simple carbohydrates. Think pasta, rice and potatoes... and potatoes and more potatoes. Unfortunately, at the high altitude, potatoes are one of the only things that will grow well. Fruit is almost non existent, vegetables are scant, and the meat is scarce because of the superstitions of the Sherpa people and lack of refrigeration. The higher one climbs, the less variety there is. In hindsight, I would have brought plenty of dried fruit, canned fish and beef jerky to aid my diet on the trip. For protein, try some Nak cheese (a Nak is a female Yak, and the cheese is definitely not properly pasteurized), or try the traditional dahl bhat (lentils and rice). If you order dahl bhat and you like spicy food, you might want to ask for it spicy, because for some reason they make food unusually bland for the tourists. The other thing I should mention about a trek through this region of the world is that water is not readily available, and a lot of the time you have to pay for it. Bring iodine tablets or a water purification system, and don't expect there to be extra water to brush your teeth or wash your face. It is extremely important to drink plenty of fluids each day at high altitude so don't skimp on the purchase of what you need to stay healthy. Finally, be wary of bottled water; it's better to treat everything and be safe rather than sorry in a place where there is not a doctor around every corner (or a toilet for that matter!). On a very windy but sunny morning, I made it to base camp. I was thankful to see the IMG village of tents and meet Eric Simonson and Ang Jangbu Sherpa, the principals of the 2009 IMG Evesest Expedition, who quickly offered me some warm Tang and a nice warm tent to sit in. It was about 11am when I reached base camp, which meant lunch was being readied. I immediately asked if I could see the cook tent. 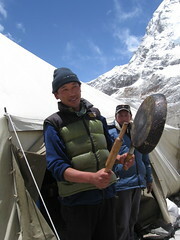 The Sherpas in the cook tent welcomed me in and let me take some photos. 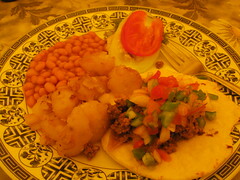 They were making potatoes, simmering meat, heating up baked beans, making chapathis, and putting together fresh vegetables for a salsa and for salad! Fresh vegetables?! I was so excited, and was told that they were washed specially for us foreigners (I wouldn't have dared touched anything uncooked at a tea lodge or in Kathmandu). At 12pm, I got to see the call to lunch, and was escorted into a tent with the Everest climbers (imagine me and a bunch of hunky guys in a tent eating lunch!). There were so many different kinds of condiments on the table, from all over the world. They served my plate, and I proceeded to dump about half a cup of Pace salsa onto my "taco" which consisted of meat and chopped veggies inside a chapathi. It tasted AMAZING. I had seconds. It was incredible food after what we had been eating for the previous two weeks. I truly enjoyed it. I guess when you pay for an Everest climb (somewhere around 70,000 US Dollars) they make the effort to get some really good food to you. While I was eating lunch with the climbers, I got to chat them up and ask them about their experiences. I'll tell you what they said about the food. Meals were served at 9,12, and 6 (afternoon tea at 3 too). 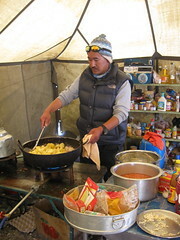 If you were heading out of base camp and upwards through the Khumbu Icefall, they'd have your breakfast ready for you at the appropriate time (as early as 3am). 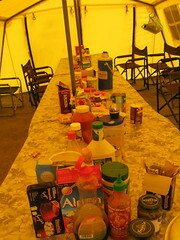 While traveling up through Camps 1,2,3 and 4, the food availability varied. 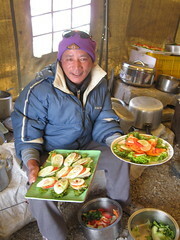 At the lower camps, IMG had rotating cooks who would make food for the climbers. 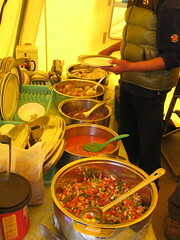 When climbers were otherwise hungry or at the higher camps, they would bring many snacks and dehydrated meals with them. At base camp, thousands of eggs were consumed by IMG climbers (I think when I was there, which was before their summit bids, they had already consumed more than 5,000 eggs). And I found it amusing that the most common meat that they ate was SPAM in different forms. I also visited the IMG Stupa, where they have a big Puja before climbing starts, and give offerings to the mountain goddess. Many kinds of little offerings are given - little bits of food for example - all to ask the mountain goddess for safe passage. It was really very beautiful; prayer flags reached from the Stupa to all corners of IMG's camp. Trekking in the Himalayas is really a unique experience. Trying to eat well is just as much of a job as putting one foot in front of the other on the way up a hill at high altitude. When trekkers and climbers get back from their trips, they acquire something called, "Climbers Amnesia." One acquires this amnesia when they realize what an awesome thing they accomplished and totally forget about all the hardships they faced. Mom and I definitely have "Climbers Amnesia," and will never forget about our adventure in the mountains of Nepal. The question for us is, what adventure is next? So happy that my favorite blogger is back to work! I have missed reading about your food adventures. Much love to you and your family this holiday season! !